Official campaigning for Uganda’s presidential election begins Monday, as candidates including incumbent President Yoweri Museveni, former Prime Minister Patrick Amama Mbabazi and main opposition leader Dr. Kizza Besigye complete establishing their campaign teams. 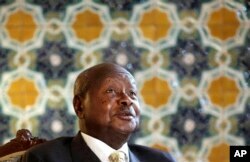 The presidential campaign will end February 16, according to Uganda's Electoral Commission. The electoral commission has warned all of the eight presidential candidates to desist from using ethnic, religious or divisive language that could create tension and possible violence during their campaigns. The electoral body says it is important that the politicians should not divide Ugandans along “tribal or religious” lines adding that the campaigns should be devoid of violence. Officials of the electoral commission say they are implementing measures to ensure the presidential poll will be free, fair and transparent. 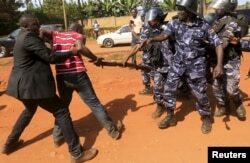 FILE - A supporter of Uganda's former Prime Minister Amama Mbabazi wrestles with the gun of a policeman, as riot police disperse a gathering in Jinja town in eastern Uganda, Sept. 10, 2015. Jotham Taremwa, electoral commission spokesman, says the electoral body signed a memorandum of understanding with the political parties to stick to the stipulations in the agreement. This, Taremwa says forms part of the process to ensure an equal playing field in the run up to the presidential vote. He says the electoral commission is working with the security organizations to enforce the agreement the parties signed before the official campaign period. But opposition groups have often accused the state security agencies of bias and doing the bidding of President Museveni and his ruling National Resistance Movement (NRM). They said their supporters face violent crackdowns, while NRM supporters are not disturbed. “That is not correct. It is an allegation, and if anyone has any complaints in respect to that the commission is always there to address those complaints. But for now I will say that is not correct [and that] it is a mere allegation,” he said.